I have a group of friends, yeah buddy I got friends. And not all of them are in low places. We call ourselves The Tots. We have been together for about 10 years. We try to get together at least once a year to smile at each other and talk about whale watching and pork buns. Please be jealous of us. We chose this trips destination to be close to Nashville. One of the Tots was performing in the International Barbershop Competition. Please check out his fantastic work with Central Standard. This sweet double edition of Panclog will include reviews of Wild Eggs and Gralehaus. Location/Environment: Gralehaus is located in The Highlands at 1001 Baxter Ave. Louisville, KY 40204. The Highlands was voted as the Tots favorite neighborhood. We had some amazing Asian fusion and BBQ in The Highlands. The environment in Gralehaus was just splendid. They had coffee sacks as drapes. They had beautiful wooden floors. They were playing TV show theme songs through our time there. It was enjoyable. Wild Eggs is a chain restaurant that you can find in 5 states. We went to the Downtown Louisville location at 121 South Floyd Street. We were able to walk to Wild Eggs from our hotel. It was a beautiful morning so we all enjoyed the fresh air. The environment felt very clean in a way that you tend to see in nice chain restaurants. Menu/Selection: The menus at these two restaurants could not be more contrasting. Wild Eggs had the standard brunch that you can find in any chain breakfast joint. Gralehaus had some of the breakfast staples but mostly with a southern twist on them. Some examples include: Lamb & Grits, Crispy Pork Hash, and Biscuit and Duck Gravy. Please feel free to peruse the menus yourself. Wild Eggs and Gralehaus. Wild Eggs: This place has no iced coffee. When told they could just pour coffee over ice, they brought out what appeared to be milk over ice. It was sent back. They got it right the second time. The food was “fine.” That is, until I tried to bite into a bit of avocado that was so hard I took it off. I tried to squish it with my fingers and it didn’t even squish. It was bizarre. The inside looked like a sterilized “First Watch” but even less exciting. Firstly, I would love to congratulate Megan Friedlander for becoming a Panclog contributor. Your check is in the mail, Friedley. 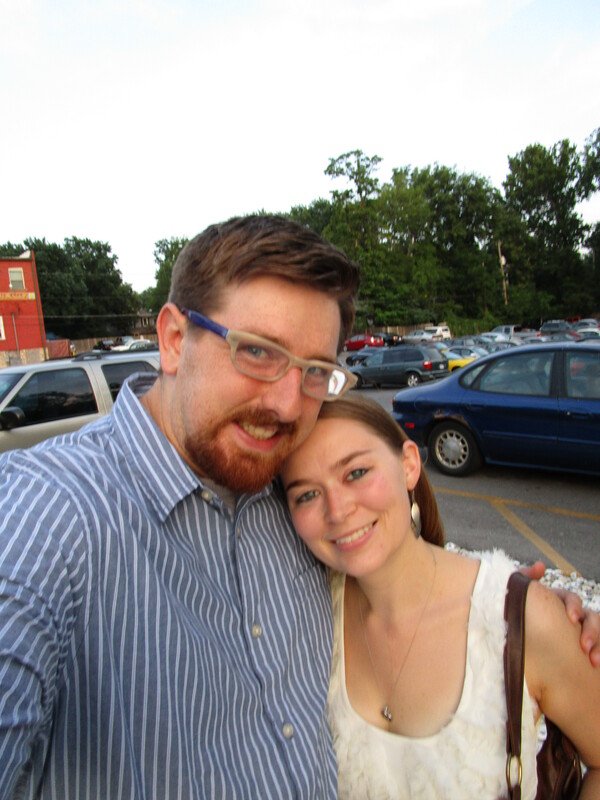 Here is a very recent picture of Megan and I. While in Louisville with your best friends is a wonderful experience, it is even more fun when you are able to try some delicious bourbon and other liquors with each other. I would love to recommend Four Roses bourbon and Copper & Kings brandy. While in Bourbon county, you will see establishments using this famous liquor to entice more sales. I fell for this approach when at Wild Eggs. I ordered the Sweet Home Apple Bourbon Crepes. These crepes were sadly the most disappointing thing I had in Louisville. They were stuffed with simple cream cheese. I could not taste any bourbon in these crepes. The apples were in a compote form in the center of the dish. I was unimpressed with the size of this dish. I can get more satisfaction from a Quik Trip taquito. The bacon on the side was a very traditional unseasoned few strips. Gralehaus is the epitome of what you desire from a hip bruncherie. Gralehaus was converted from an old house in The Highlands to a trendy bed and breakfast. The seating was truly difficult to maneuver with 8 guests. We had to stand around awkwardly for 8 or so minutes until we made a guest who was sitting alone at a table for 4 so embarrassed that he moved to the bar. Gralehaus does have a nice patio area in the backyard of this house. It was raining this morning so we were unable to enjoy this spacious patio area. I truly enjoyed the atmosphere of Gralehaus so much. Ordering is a lot like how it’s done in Nashville, order first than find a place to sit. The drink menu was pretty expansive. From coffee drinks to fresh juices to beers on tap. It was past 11 and I was on vacation so I enjoyed an adult beverage. I was able to delight on a Festina Peche from Dogfish Head brewing. I apologize to everyone in Kansas City who has not been able to partake in one of the more revolutionary breweries in America. Get some Dogfish Head whenever you are able. My darling bride got a Chai Tea to keep her warm from the cool summer rain outside. The Chai was wonderfully flavored with a dusting of nutmeg and cinnamon on top. Let’s get down to brass tacks. What was for breakfast. It was Biscuit and Duck Gravy at $12 and a large side of Grits for $4. The biscuit and duck gravy was sensational. The biscuit was just soft enough to soak in some of the gravy but sturdy enough to flake perfectly when cutting into it. There were bits of duck crackling all around the plate. This gave a nice saltiness to the dish. This was all topped with a sunny side up egg. Grits. Have you ever enjoyed some perfect grits? I hadn’t. Not until I saw grits predominately featured on the Gralehaus menu and decided, “in the south? Try grits!” I was not let down by this decision. It was a little thicker than oatmeal. I do not know how to truly describe this fantastic side. Buttery goodness? That is probably as close I will get. TRY IT! Location/Environment: Gralehaus is a hipster’s paradise aesthetically, but I don’t mean that as a negative. Nothing about it read as inauthentic to me. But you will find eclectic art on the wall, cold brew coffee, and baristas with 8 o’clock shadow and skinny jeans. Our visit featured a soundtrack of TV theme songs, which was much appreciated and quickly set the mood. Jovial and friendly. Despite the hipster factor, I felt little pretension behind it. Service: It was your standard counter-service affair. Order, find your seat and food is brought to your table. We went during a busy brunch hour yet service was still quick and efficient. There was limited seating inside but employees were very accommodating to help customers find available seating. Menu/selection: Gralehaus does not featured the biggest menu, but let’s face it, they don’t need to. Everyone in our party of eight was quick to find something to their liking. You’ll find classic items but done in a unique, memorable way. The varied drink selection was a welcoming sight as well. Standard breakfast choices, as well as a rotating bar menu. Oh yeah, also there’s ice cream ya dinkuses. Food: I ordered the speculoos crepes with a side of bacon and an iced cold brew. Let’s start with the coffee. Iced or hot, I like my coffee like I like my death metal: black (and Norwegian?). Gralehaus offered a tight, smooth cold brew. Just enough acidity and super fresh. Alright, those crepes. Holy. Hell. The basis of the crepes were a ricotta cheese, and I wasn’t sure how they would work with the speculoos cookie bits. In short, it worked, very well. Smooth, creamy crepes in a fluffy pillow, with crunchy highlights from the cookie bits. It was essentially a dessert for breakfast, and it was what syrup dreams are made of. The bacon was a savory accent to the crepes. Portions were fantastic; with something this sweet, I don’t think you’d want to stuff yourself. Price: Not cheap, not expensive. For the quality of the meal, it’s certainly worth it. Overall: I couldn’t give Gralehaus enough praise. If you’re in the Louisville area and looking for a solid, unique breakfast spot, it’s worth the visit. Our party left full and satisfied, a memorable experience. Overall: I love to explore new cities. It gets difficult when you are judging a city by what Yelp and other travel ranking sites tell you what is best. I would strongly encourage you to find someone who is roughly in the same stage of life and coolness level as as you are and ask them what they like in their city. This will most likely not guide you to a family vacation spots and not super club-y. Enjoy your friends and be open for new experiences. Life is better when you share it with others. As for breakfast spots. Skip Wild Eggs. Definitely hit Gralehaus. You can follow Jared and Megan on Twitter. So thick and so pretty. I hear it was fantastic too. February 25th, 2016 – 7:03 A.M.
John’s Space Age Donuts is a locally owned donut shop in downtown Overland Park. John’s Space Age has been around since 1967. They are open Tuesday-Sunday 6:00 AM to Noon. Check them out on Facebook. Location/Environment: John’s Space Age Donuts is located at 81st and Metcalf. The parking is semi-confusing. The parking lot is in the back. But there is a dead end street right to the north of the entrance to the parking lot. The environment is clean and crisp. The display case of all of the fresh donuts are right at the front. When you are in the parking lot, there is a distinct smell of baked dough. It is the perfect appetizer to get your mouth watering. There is not a lot of seating in the shop, perhaps 20 seats or so. Service: The service was all you can ask for and more. The server is truly attentive and will happily make any recommendations if you would like to try something new. There is a never ending supply of friendly banter between servers and customers. I witnessed 3 different customers that were offered their “usual” in the 35 minutes that I was there. Menu/Selection: John’s Space Age has all of the donuts. From the voluptuous jelly filled to the delicate and flaky classic glazed, the controversial donut hole to the kind and loving apple fritter. They have a nice partnership with Nesquik. They have Nesquik stickers on each of the napkin holder and a nice Nesquik fridge in the back. The Nesquik is wonderful due to its bunny mascot who sells dairy products like a boss. When I heard we were headed over to John’s Space Age Donuts for this Panclog I was pretty excited. With a name like that I had expected something akin to Voodoo Doughnut out of Portland, OR. For good or ill, John’s turned out to be a regular donut shop. Overall I would say that John’s Space Age Donuts is friendly little place where the staff is quick to engage and chat with you, which is always a plus in my book. There also seemed to be a steady stream of people strolling through the place, so you can tell they are assembling a good following. A quick word of caution though, John’s is a cash only establishment. This surprised me a bit as I have grown accustomed to using my debit card wherever I go. Needless to say I didn’t have any cash and had to rely on my good friend, the amazing and talented, Jared Sova to save me from my faux pas. Jared’s armor shined that morning. Jared purchased a dozen and was kind enough to not only let me share his donuts, but also, to select some of the flavors. I don’t remember all of the choices we put in the box, however, I will comment on the four I had. Plain Cake – I know what you are thinking, “Plain Cake, how boring.” I added this to the box for a couple reasons. Firstly, a plain cake, if done right, is a really good donut. Secondly, a plain cake is probably the simplest donut to make, at least I think it would be, thus leaving the bakers with no place to hide. Any mistake in the baking and you will know immediately on tasting. I can say with confidence that they did a fine job on the plain cake donut. Although it could have been a touch sweeter. Glazed – Another simple donut that does not leave much room to hide. All donut shops should be judged on how well they can knock out a glazed donut. John’s Space Age raised, glazed donut was decent. The glaze was well set and the donut was not soggy. I found this donut to be similar to the glazed from Fluffy Fresh, another Kansas City Area Donutisserie. Raspberry Filled Sugar – The Raspberry Filled Sugar donut itself was good, unfortunately the Raspberry Filling had a distinct artificial flavor. I suspect that the filling is artificial, or at least not made fresh on the premises. Any donut shop that could produce their own, fresh fruit fillings would probably knock it out of the park for me. Apple Fritter – The Apple Fritter is John’s best, hands down. It is actually one of the better apple fritters I have had in a long while. The balance of cinnamon, sugar, and apple flavorings was well performed. The outer shell was crisp and the inner dough was soft making for a great texture. It also helped that fritters were freshly made and still slightly warm. Kudos to the bakers on this one. Donuts are a basic human right. Good donuts are a luxury. I would like to start this op-ed of sorts with a story of friendship. I met Brent Morgan in church in the year 2006. He has been a kind and faithful friend and mentor ever since. He was the officiant at my wedding and has been my greatest ping pong rival. He can also fix a mean light socket, contact him here for help. In a nod to days of old and days of old people. Brent and I have begun a tradition of weekly breakfasting. It is a time to catch up and to debate new topics while enjoying breakfast in a different place each week. We call this act Breakfast Buddies. If you can join some morning, we would more than pleased to have you. Search #BreakfastBuddies on twitter if you would like to catch up on news! Donuts are usually not my thing. Probably because I have plenty of open cavities in my mouth, therefore the sweetness of the glaze makes my teeth hurt. But I kept hearing good things about John’s Space Age Donuts; I had to inspect. I prefer the spelling donut to doughnut or the ever ugly spelling: do-nut. No one should ever spell it with a dumb hyphen. If you are at any donut shop and they share that a certain type is fresh from the oven, GET IT! Warm donuts are always better than their cold counterparts. This day was dedicated to the Apple Fritters. They were fresh from the oven. But moreover than that a guest recommended the fritter sharing, “Get tha Fritta! Or FOUR! HeHeheh!” You gotta trust that guy, amirite? These apple fritters are fantastic. Please get them whenever you can. I also had a delicious cinnamon roll covered in white frosting and chopped nuts. Have you ever witnessed a coworker bring in a box of donuts just for them to Jamie Kennedy Experience you with the donuts all being glazed? You are probably thinking, “You know that they make different kinds, right?” These glazed donuts were different. They had a nice flaky dough and not overly sweet glaze. Overall: This donut shop has a truly friendly staff and above average donuts. If you like donuts, try it. I would not recommend this place to non-donut believers. I do not think that the donuts are good enough to change your mind. Last words: APPLE FRITTER WINS! February 9th, 2016 – 7:07 A.M.
Mom’s Kitchen is a locally owned diner. It is located in near downtown Olathe at 530 E Santa Fe. They do not have a website. But you can check out their Facebook. They are open from 7 AM-2 PM on Sundays and 6 AM- 2 PM every other day of the week. Location/Environment: The restaurant itself is a simple whole-in-the-wall type of place pretty close to the Olathe, KS courthouse. If you are one of the lucky few on jury duty, I would recommend walking over to this place for a quick and easy lunch. Please read that last sentence without a thought of sarcasm, you should be excited about fulfilling your civic duty. While we are on the subject of civic duty, get out and vote! I would not describe Mom’s as a greasy diner. I would describe it as a diner that has aged well. Service: The service was wonderful. Coffees stayed full. You could tell that Mom’s Kitchen was the type of place that servers are happy to learn names and to swap stories of what’s good in their lives. Menu/Selection: Mom’s Kitchen is full of the standard breakfast foods and also the extended diner menu. If you can find it at a diner, Mom’s will take care of you. Food: Below you may read some pancake topping blasphemy. Please take up all disappointed and offended feelings with Brent’s Twitter. You have been forewarned. Mom’s kitchen is a straight up diner from years past. At least that is the feeling they seem to be going for. It a restaurant I, and my family, like a lot and one we should probably go to more often. It helps that we are friends with one of the staff who is a terrific person. Mom’s kitchen offers the standard breakfast fare you’d expect from a diner. I was tempted to go for the chicken fried steak and eggs, or the pork chops, but instead I ordered pancakes with bacon, eggs, and hash browns. I was quite pleased with them. My guess is that the full menu of items is available throughout the day as I saw another patron order a cheeseburger. One of these days I am going to have to get over my cultural mores and order a French Dip sandwich for breakfast. The pancakes were light and fluffy, the bacon was cooked just right, the hash browns met expectations, and the eggs were decent. Overall, it was a very satisfying breakfast. The coffee was great too. Some of the other places we’ve visited should do themselves a favor and hop on over to Mom’s to see what they are brewing. Mom’s coffee is full flavored without a burned, or over-roasted, quality. Mom’s Kitchen isn’t trying to find some interesting twist on the burned flavor that the Seattle based organization seems to love. You may have noticed a lack of syrup on the pancakes in the picture. For good or ill, I am not a fan of maple syrup on pancakes. Actually, with rare exception, I am not a fan of other syrups on pancakes either. Part of the issue is that maple syrup doesn’t taste good in my opinion. The other is a texture thing. Syrup has a tendency to turn pancakes into soup. A pancake is a glorious food item. Pancake soup, not so much. For those fretting over the fact that these pancakes look incompletely adorned rest assured I added more to them than just butter. Although plain buttered pancakes are quite tasty in their own right. You see, when it comes to pancakes, I am a jelly man. Adding some straight up plain grape jelly on pancakes makes them magnificent. And let’s keep it to plain grape jelly. If you bring Concord grape jelly, well, you can fly that plane straight back to France. Or back to Concord, Massachusetts, as that is where Concord Grapes were originally developed. To whom do we owe for this amazing culinary secret, Mrs. Martin, my kindergarten teacher. She made pancakes for our class one morning and offered jelly as the spread and I have followed the nobler jelly path from that day forth. Just once I recommend that you set the syrup aside and go the jelly route. I am certain you won’t look back. Mom’s Kitchen is such nice name. It makes me think of such great breakfasts that my mother has made me in the past such as Dutch Babies, Cinnamon Rolls, and of course pancakes. So yeah, these are good memories. If you do not know what Dutch Babies are, then you are truly missing out. Mom’s did not disappoint. When I walked in I saw a chalkboard sign that informed me of the specials then told me to ask about their Blueberry French Toast. I try to always abide by things signs tell me to do. I asked our waitress of their blueberry french toast and she kindly told me that it was french toast made with actual blueberry bread made by them. I was truly intrigued. It never had a chance against me. One of my greatest enjoyments of being married to a chef is some incredible banana bread. And when that banana bread starts to almost become stale, we french toast the crap out of it. So freaking good. I am a huge fan of delicious flavored bread being turned into even more delicious breakfast treats. I was expecting a blueberry quick bread type of flavor. Meaning overly sweet and intensely blueberry-y. But Mom went against my expectation and created a simple blueberry hint to the french toast. It was just the perfect hint of blueberry in every bite. I can not say anything negative about these French toast slices, except that I should have ordered something savory to counteract the sweetness of the syrup and powdered sugar. The coffee was in the top 3 of coffee I have had during my Panclog career. Seriously, they do it so well. Also I enjoy that the coffee mugs were of a thicker variety. This keeps the coffee warm!!! MAGIC! Overall: Mom’s Kitchen is a lovely bruncherie that makes you feel at home if you are a regular. It can be slightly daunting when you see a waitress treat some guests like family and others like one-time guests. The interior feels dated but it makes the food taste that much better. Check it out with your friends on New Years Day or any other day. January 12th, 2016 – 7:05 A.M. Corner Bakery Cafe is a nationwide fast-casual chain. We went to the 11705 Roe Ave. Leawood, KS location. You can check out their website here. Also please check out their Twitter. If you are thinking that you feel the strong urge that you need this, you are not the only one. I need this baker in my home. Service: The Corner Bakery Cafe is a pay-first style restaurant. You go up the cashier, who has a large menu on the wall behind them. This style does not often lend itself to great service. That being said, our cashier was very sweet and our plates were cleared promptly after our meal. Menu/Selection: Corner Bakery Cafe has breakfast, lunch, and dinner. They also have some nice baked goods for snacking. It tends to be of a lighter fare. They have plenty of sandwiches ranging from breakfast to grilled panini. You can browse the full menu here. Ordering is done at the counter where the menu is displayed high above. There is an array of baked goods and breakfast sandwiches offered. I went ahead and ordered pancakes, which did seem slightly out of place given their other menu items. Looks tasty doesn’t it. Two-thirds of it was. The bacon was quite tasty and well cooked. My preference for bacon is to be crispy and juicy. The Corner Bakery did an excellent job at hitting the bacon sweet spot. The eggs were also very good. They were dense but light on the palate. I was quite happy with how those two items turned out. Unfortunately, it would have been wiser of me to have opted for a bacon and egg breakfast sandwich. As you have surely guessed, I was displeased with the pancakes. There were a few things going on with these flapjacks that left me disappointed. Firstly, the pancakes were not completely cooked through. Secondly, there was a definite waxiness to the cakes that left a sad aftertaste and texture to the pancakes. 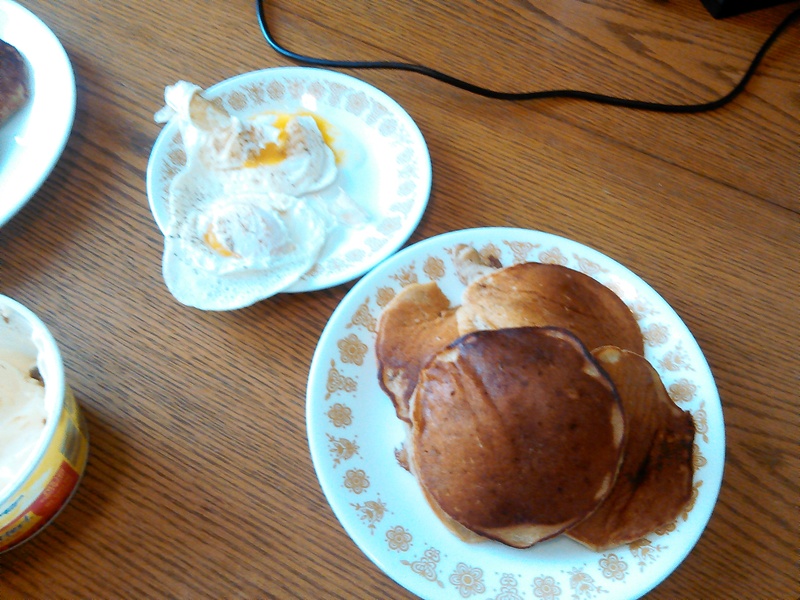 Lastly, there was a distinct pickle flavor to the pancakes that implied an accidental spill occurred in the kitchen. Hopefully we caught the kitchen on an off day and that it is not indicative of their normal output. They certainly looked nice on the plate, but those looks were deceiving. Per usual, I had black coffee with breakfast. The Corner Bakery offered four different roasts that morning, and I went with their darkest roast available. The coffee was good, but not better than what I can make at home. Considering its price, $2.29, that was a little disappointing for an expensive cup of coffee. I went in a different direction, didn’t I? This Commuter Croissant is exactly what it looks like. Tastiness. I could have eaten 3 of them. That is saying more about my ogre-like appetite than about the size of this nice sandwich. This appetite is why I built one of those “complete breakfasts” you always see at the end of cereal commercials. I added on some oatmeal and a slice of cinnamon creme cake. The ordering process was a bit different. After ordering and paying, I was given a buzzer. The same type that they give you at Cheddar’s when they are packed and you have to wait for your Monte Cristo. Not that I have a lot of experience with that. When I sat down, I assumed I would have to get back up when the buzzer did its thing. It never buzzed, but I was brought my food. This wasn’t a negative. But it did seem unnecessary to use the buzzers. The sandwich was scrambled eggs, tomatoes, bacon, and cheese all on a buttery soft croissant. I enjoyed this breakfast sandwich. The tomatoes added a nice acidity to the heartiness to the sandwich. I added on some steel-cut oatmeal for $1! It felt like a steal, I could not pass on this fine deal. The oatmeal was topped with the perfect amount of cinnamon. It was enough to flavor the whole cup without overpowering the creaminess of the oats themselves. The oatmeal also was not hard like when I make it at home in the microwave. So that was cool. Cinnamon Creme Cake was a nice table share. It was dense like most coffee cakes, and very rich. This richness led to the urge to share it with my tablemates. Overall: (Brent) Overall, I would give The Corner Bakery a C-. I am not a fan of giving out such a low grade, but I think you have to if you do not plan on returning. I’m not saying this restaurant should be placed on the banned list, where you would actively refuse going, but it shouldn’t go on the suggestion list. (Jared) I would have to agree with the sad sad pancakes. I had a couple of bites and I knew something was wrong with them. I am surprised he finished them. My sandwich and sides were tasty. There was nothing to dislike about my meal. These hotcakes are NOT heresy! The House that Panclog Built. In support of one of the most sacred holidays in the Söva household, National Pancake Day, I have decided to share with you a very special Panclog. I would love to tell you about the delicious (spoiler!!!!) pancakes I get at home! My wife, Megan, recently discovered that she is allergic to a incredible array of different things. (Gluten, Corn, Peanuts, Sweet Potatoes, Salmon.) With her being the sweet thing that she is, she continues to make breakfast for us when she could easily give up on pancakes and buy some Eggos or some other sad frozen food. Location/Environment: I really like living in my house. It is a pretty cool house. I know where almost everything is except for the hand mixer, duct tape, and the extra stash of toilet paper. I think it feels nice. It smells like essential oils and food. Wait to be seated: I LIVE HERE! ALL THE SEATS ARE MINE! Megan has taken her allergy diagnosis in great stride. It probably helped that she is a chef. She makes her own gluten-free flour, some fantastic corn syrup-free caramel apple butter, and awesome everything cookies. I am constantly in awe over the skills that my wonderful bride has developed in the kitchen. Megan made this recipe for Gluten Free Caramel Apple Butter Pancakes with a little help from Pinterest. You can find the recipe to the Caramel Apple Butter HERE!!!! Pinterest is seemingly an endless supply of fancy recipes, silly jokes, and impossible crafts. I recommend it if you have a computer or phone and want to waste hours of your life. These pancakes are some of the most delicious things you will ever have. Because they are gluten-free, these pancakes tend to be pretty dense. They soak up all of your syrup within a minute. They also will fill you up quicker than your average flapjack. I am not complaining about this fact. I am just noting it for you who are lucky enough to enjoy brunch with us. Now to the eggs, we usually cook eggs in a wok. But when we make pancakes we use the griddle, which gives the eggs an incredible fluffy texture. I should do some research on different ways to cook eggs. Somebody remind me to do that! We have begun to use real maple syrup for 2 reasons: 1. Real maple syrup tastes so much better than its artificial counterpart. 2. Fake maple syrup has high fructose corn syrup in it, which Megan cannot have. Try real maple syrup and you will not regret it. Try it! You’ll like it! Overall: I am incredibly lucky to have married a chef who likes to feed delicious food. These caramel apple butter pancakes are the best gluten free pancakes I have ever experienced. I definitely recommend coming over for some breakfast, brunch, or brinner! Price: Gluten free ingredients are more expensive at first, but are entirely worth it if you or someone you love is gluten-free. Grade: Can I say anything other than an A+? I wouldn’t even if I could.